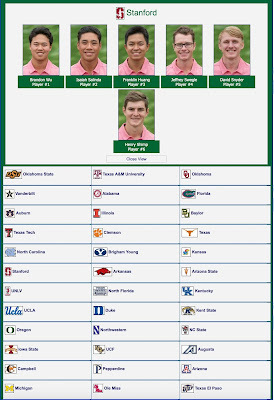 nation’s best golfers Monday after finishing 15th at the NCAA Championships on Monday at Karsten Creek Golf Club. One day after the Cardinal was eliminated from the team portion of the postseason event, Salinda went on to represent Stanford in style. He was even-par for the 72-hole stroke-play portion of the event after rounds of 71-69-75-73. Salinda was 2-over though six after a double-bogey on the par-3 third, but closed with birdies on two of the last three holes before making the turn. He had seven straight pars, bogeyed the par-4 17th and birdied the par-5 18th. As a sophomore, Salinda was 44th at the NCAA Championships. Augusta’s Broc Everett claimed individual medalist honors with a birdie on the first hole of a playoff against Auburn’s Brandon Mancheno. Their 7-under 281 sets the course record for a 72-hole score at Karsten Creek. On the team leaderboard, tournament host and top-ranked Oklahoma State finished eight shots ahead of any other team in the field. The Cowboys’ 1,152 is a Karsten Creek 72-hole record. AFTER ROUND THREE – Isaiah Salinda advanced to the fourth and final day of stroke play with a solid outing Sunday at the NCAA Championships contested at Karsten Creek Golf Club. Salinda, tied for 22nd, signed off on a 3-over-par 75 to earn the right to compete for the individual national crown, which will be determined Monday. Salinda tees off Monday at 10:40 a.m. PT. Salinda (71-69-75) was 1-under through 54 holes, including a one-birdie third round. 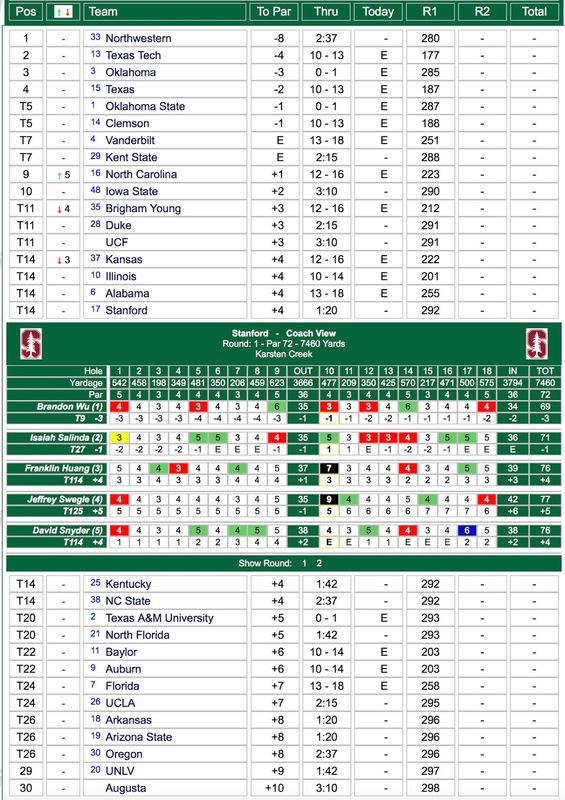 Stanford (292-295-297) tied with Northwestern for 16th after a final-day 9-over to bring its total to 20-over. The Cardinal found itself outside of the cutline (+18) through 54 holes, as the field was trimmed to the top 15 teams and the top nine individuals not on an advancing team after Sunday’s round. Swegle punctuated his final round with a team-best 3-under 69, including five birdies. He even birdied the par-5 18th to finish his round on what would be the final hole of his career. Swegle (+6) tied for 57th. Brandon Wu (69-82-74) tied for 83rd at 9-over, and Franklin Huang (76-74-79), who Ray said has been “the heart and soul of the team all year” tied for 117th at 13-over. David Snyder tied for 137th at 17-over. For the third straight day, the Karsten Creek Golf Club course record was shattered, as Duke posted a 12-under 276 to skyrocket to the top of the leaderboard. Duke’s showing was three strokes better than the previous course record, set by Alabama during Saturday’s round. The Blue Devils’ 10-under 854 is also a 54-hole record for competitive events played at Karsten Creek. Clemson’s Bryson Nimmer held the clubhouse lead through 54 holes after shooting a 68 to get to 9-under for the week. His 207 is the lowest 54-hole score recorded at Karsten Creek, surpassing Josh McCumber’s 211 at the 1996 Karsten Creek Collegiate. STILLWATER, Okla. – After two rounds, Stanford is in 18th place needing to move up to the top 15 in its 3rd round to make the cut before the fourth and final round of medal play. The field is bunched with the Cardinal only 2 strokes behind the 13th position and only 8 strokes out of a tie for 6th. 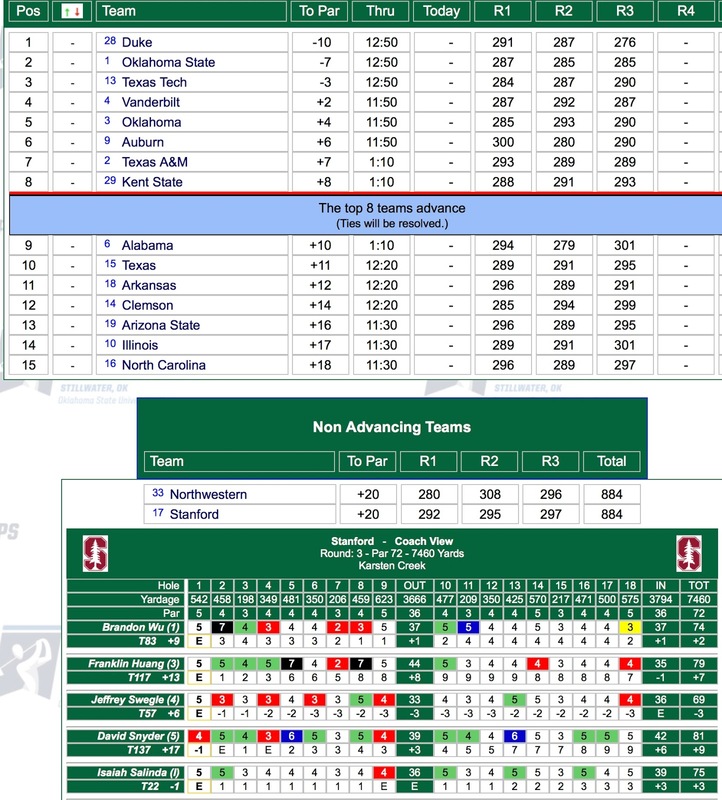 So a solid 3rd round should move Stanford into position to make a run at match play. Isaiah Salinda’s six-birdie outing at Karsten Creek Golf Club gave the Stanford men’s golf team a lift Saturday during the second round of the NCAA Championships. Salinda, tied for ninth, finished with a 3-under-par 69 at the 7,460-yard track. Three bogeys speckled Salinda’s scoreboard, the penultimate coming on the par-3 seventh to bring him to even-par. Salinda then birdied Nos. 8 and 9 to turn at 2-under, then dipped to 3-under with a birdie on the par-5 14th. He closed with a bogey on the par-4 17th and a birdie on the par-5 18th. Stanford (292-295) is 11-over through 36 holes. Franklin Huang had the hot hand on the back nine, dropping four birdies to conclude his round with a 2-over 74. Jeffrey Swegle was five strokes better than his opening round with a 4-over 76, a score matched by David Snyder. Brandon Wu was 10-over, and tied for 100 at 7-over through two rounds. Sixth-ranked Alabama posted a 9-under-par 279 and Clemson’s Bryson Nimmer wrapped up his first round logging an 8-under-par 64. Alabama’s record-setting mark was the second time that the Karsten Creek course record was broken this week, as the Crimson Tide’s number surpassed Northwestern’s 8-under from Friday’s opening round. The Crimson Tide sit two strokes off the leaders, No. 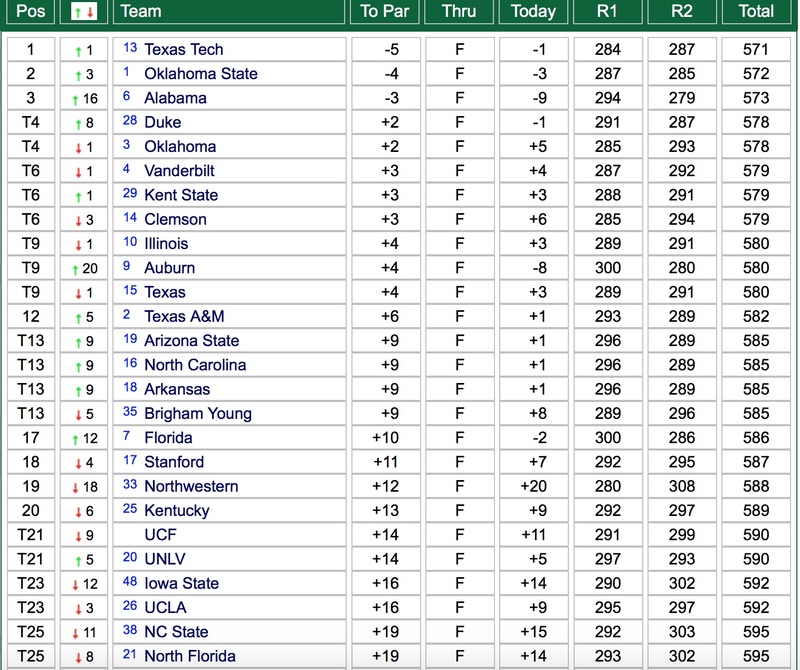 13 Texas Tech, which posted a 1-under 287 to get to 5-under for the week. Tournament host and top-ranked Oklahoma State is second at 4-under. The Cowboys were one of just six teams to shoot under par on a Karsten Creek course that bared its teeth in the second-round of stroke play. 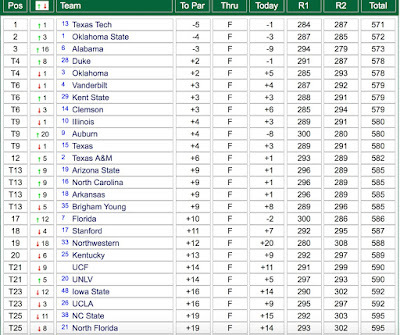 Oklahoma State, Alabama and Texas Tech are the only three teams under par through two rounds of stroke play. Nimmer notched eight birdies and was bogey-free during his opening round, which he concluded Saturday morning. His 8-under 64 passed LSU’s John Peterson, who shot a 7-under 65 during the 2011 NCAA Championships, for the Karsten Creek record. Auburn’s Brandon Mancheno is the current leader in the clubhouse at 6-under after firing the best round of any player on the course Saturday, shooting a six-under 66. 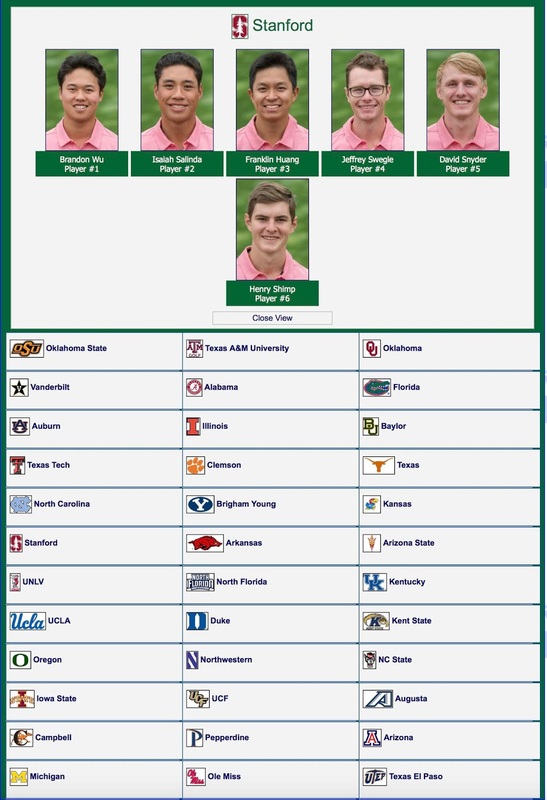 The third round begins Sunday morning, and at the conclusion of play, the field will be cut to the top 15 teams and the top nine individuals not on an advancing team. The remaining teams and players will advance to Monday’s fourth and final round of stroke play. Second round scoring is shown below - click on images to enlarge. 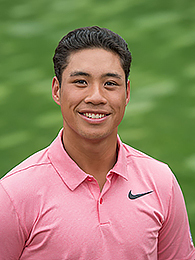 STILLWATER, Okla. - Junior Brandon Wu shared the clubhouse lead for portions of the NCAA Championships' opening round Friday at Karsten Creek Golf Club, ultimately placing ninth at the completion of play. See Stanford scorecards and team scoring for day one below. The first round was set back by a rain delay lasting nearly two and a half hours. Then Wu turned on the heaters with a 3-under-par 69 that featured five birdies. His two bogeys came on the par-5 ninth and 14th. "I'm happy with how the guys hung in there after a tough first few holes," said Conrad Ray, Stanford's Knowles Family Director of Men's Golf. "The storm was clearing out after the delay and the 10th hole was playing very difficult. The course was very challenging, and I feel like we can save some more shots in round two." Stanford posted a 4-over 292 for 14th among the 30-team field. Isaiah Salinda was even-par through his first nine, knocking down an eagle on the par-5 first hole to start the back. He went 1-under on the front for a 71 to share 24th place. Franklin Huang and David Snyder posted matching scores of 4-over 76, and Jeffrey Swegle was 5-over. After overnight and morning rainfall, Karsten Creek was left susceptible to college golf's best competitors, and several individuals took advantage of the course's soft conditions. Northwestern's Ryan Lumsden was one of those, as he is tied for the lead in the clubhouse after posting a 5-under 67. Northwestern shot an 8-under 280 on the first 18 holes, surpassing the course's single-round record. The previous low 18-hole score in a team event was a 6-under 282 put together by Florida at the 1996 Karsten Creek Collegiate. Northwestern's record-setting performance gave the Wildcats a three-shot lead, with first-round play called to a halt with several schools still on the course due darkness. Two rain delays totaling 3:28 made for a long day for the 30 teams and six individuals competing. The NCAA Championships features three days of stroke play, with the top 15 teams and nine individuals not on an advancing team moving on to the final day of stroke play. The top eight teams advance to match play to determine an overall champion. STANFORD, Calif. – For the 11th time in the last 14 years, Stanford will tee it up in the NCAA Men's Golf Championships, May 25-30 at Karsten Creek Golf Club in Stillwater, Oklahoma. Thirty teams will compete for the national title. The Cardinal is coming off an impressive second-place showing at the NCAA Pacific Regional at The Reserve at Spanos Park in Stockton, California. Stanford combined for a final-round 11-under-par 277 -- the best score by any team during the 54-hole event. The third-seeded Cardinal concluded at 19-under 845, one stroke behind Kansas. The Field Thirty teams and six individual will compete. • Stanford is participating in the NCAA Championships for the 11th time in the last 14 years. The Cardinal has captured eight national titles, previously winning in 2007, 1994, 1953, 1946, 1942, 1941, 1939 and 1938. Stanford has produced three individual winners: Cameron Wilson (2014), Tiger Woods (1996) and Frank "Sandy" Tatum (1942). • Wu finished second at the NCAA Pacific Regional with a career-best score of 14-under 202, shooting rounds of 67-67-68. An All-Pac-12 first team selection in 2017-18, he has posted four top 10 showings and has led the squad in five of 11 tournaments. • Huang has four top 10s, while Salinda has three tops 10s. • Swegle fired a career-best 8-under 63 at The Goodwin at Harding Park Golf Course in San Francisco, tied for the fourth-lowest score in program history. He posted a career-high second place finish. • Karsten Creek Golf Club will host the 2018 NCAA Division I Men's and Women's Golf Championships. Karsten Creek has previously hosted the NCAA Men's Golf Championships in 2003 and 2011. • Karsten Creek was built in 1994 for the Oklahoma State golf teams. It was designed by Tom Fazio and honored as the "Best New Public Course" for 1994 by Golf Digest Magazine. It can be stretched more than 7,400 yards with SR1020 bent-grass greens and zoysia fairways. All of the holes were carved out around the native oak trees surrounding Lake Louise. • In the May 1998 edition of Golf Digest, Karsten Creek Golf Club was awarded its first five-star rating, making the course one of 10 in the nation to be so honored. Since that time, the course has gone on to receive numerous accolades. Karsten Creek joined the likes of Pebble Beach Golf Links, Spyglass Hill Golf Course and Pinehurst Resort and Country Club (No. 2). Four of these courses have hosted major championships, and most of the others maintain national prominence. While other courses are located in resort areas or near the coasts, Karsten Creek's surprising beauty is derived from an unsuspecting tract of land that is densely covered with black jack and pin oak trees and contains dramatic elevation changes that are not common to the heartland of America. As the course continues to mature, it steadily climbs all of the top 100 lists across the country and has been ranked as the best college course in the country by Travel & Leisure Golf magazine.